During IFR flight in VFR conditions, the pilot is explicitly responsible with visually seeing and avoiding other traffic. Do not assume that ATC is doing the watching. Turns are a fundamental maneuver in aircraft flight. When an airplane banks, the lift vector is redirected to the side. The turn results from the horizontal component of lift. Centrifugal force opposes this horizontal lift force. During coordinated flight, the tail tracks the nose. Think of the ball (in the inclinometer) as a representation of the airplane’s tail. The center marks represent the nose. When the ball is centered, it is tracking the path of the nose. In uncoordinated flight, that is, when the tail does not track the nose, a dramatic increase in drag occurs. If the tail falls inside of the turn radius, a slip is occurring. If the tail swings outside of the turn radius a skid is occurring. Centrifugal force is greater than the horizontal component of lift in a skidding turn. Leveling off from climbs and descents requires some planning. Otherwise, an altitude overshoot may occur. To prevent this, begin your leveling procedure early. Don't wait until you are on altitude to transition to level flight. As a rule of thumb use 10% of your vertical speed to produce a target transitional altitude. If you are climbing at 1000 feet/min, begin to level off at 100 feet prior to your desired altitude. Likewise, if you are descending at 500 feet/min, begin leveling off 50 feet prior to your desired altitude. To level off at a higher airspeed than your descent airspeed, use 25% instead of 10%. To level off at an airspeed higher than the descent speed, the addition of power should be made, assuming a 500 FPM rate of descent, at approximately 100 to 150 feet above the desired altitude. Strive for smooth transitions in pitch. For small altitude changes, generally those of less than 100 feet, change pitch by a half-bar-width (or less) on the attitude indicator. For changes of more than 100 feet use a full-bar-width and adjust power. Wake turbulence is generated as spinning vortices of air from airplane wingtips. Larger aircraft create larger (and more dangerous) vortices, especially for light aircraft. Wake turbulence is generated any time an airfoil is creating lift. The greatest vortex strength occurs when the generating aircraft is heavy, clean, and slow. The vortices trail these aircraft by several miles, sinking and spreading over time. Dynamic hydroplaning occurs when there is a film of water on the runway that is at least one-tenth inch deep. As the speed of the airplane and the depth of the water increase, the water layer builds up an increasing resistance to displacement, resulting in the formation of a wedge of water beneath the tire. At some speed, termed the hydroplaning speed (VP), the water pressure equals the weight of the airplane and the tire is lifted off the runway surface. In this condition, the tires no longer contribute to directional control and braking action is nil. Hydroplaning can occur when landing on a runway surface contaminated with standing water, slush, and/or wet snow. It can seriously affect ground controllability and braking. The three basic types of hydroplaning are dynamic hydroplaning, reverted rubber hydroplaning, and viscous hydroplaning. 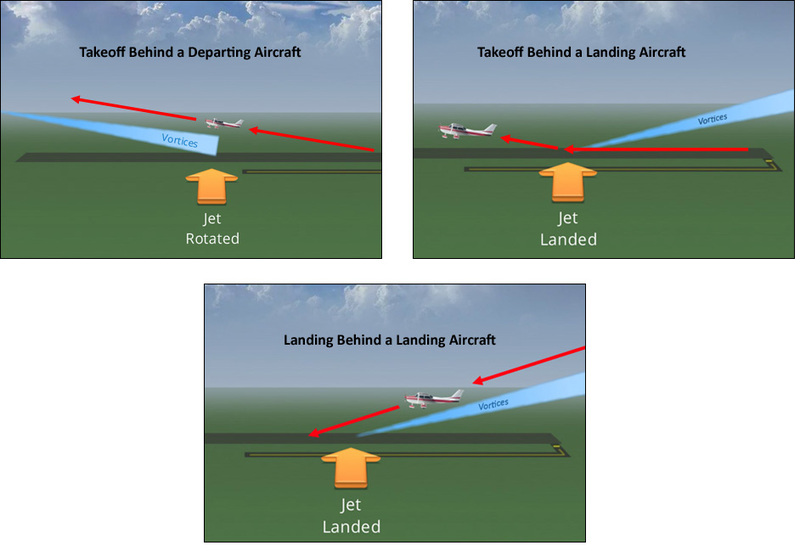 Any one of the three can render an airplane partially or totally uncontrollable anytime during the landing roll.